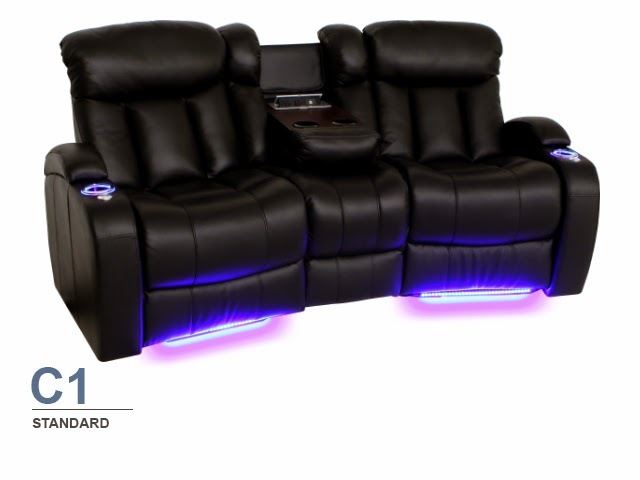 The Grenada LX sectional is a deluxe home theater setup that can be configured into loveseat, sofa, and curved row configurations, with or without wedge consoles. 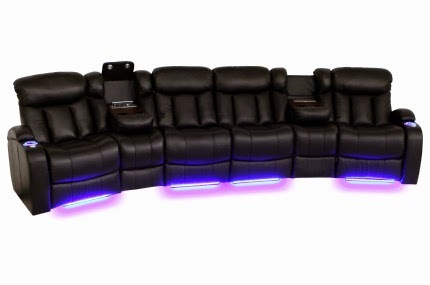 This unique design also features several hi-tech additions which make it one of the most sophisticated sectionals on the market. The design of the Grenada LX features strong, bolstered seat backs, topped with generously overstuffed headrests. The contemporary look exudes a smooth confidence that also secures your frame in plush comfort. Black and brown color options add to its striking look, and are able to match any home theater decor with ease. The seats of the Grenada feature a gently curved bottom which allows you to sink in for maximum leisure, Stretch out with a full chaiselounger, which eliminates the traditional gap between seat and footrest for a full, pampered cushion of the lower body. The Grenada LX is fashioned from Leather 7000, a premium grade of leather that exudes a luxury ambience. This material is carefully handpicked from the top third of all hides and then buffed to remove any imperfections, resulting in a leather with an exceptionally fine grain and smoothly textured feel. As you wrap yourself in its folds, your senses will be caressed in turn, right down to the material's distinctive aroma. Leather 7000 provides easy maintenance--just rub down with a dampened cloth on occasion--and if properly cared for, will only improve in patina and softness over time. The Grenada can be enjoyed as a loveseat and sofa, or as curved row configurations with unique wedge consoles. Each wedge console folds down to reveal an overhead reading light, cup holders, power recline switch and USB ports! Cup holders keep your beverages secure and within easy arm's reach. 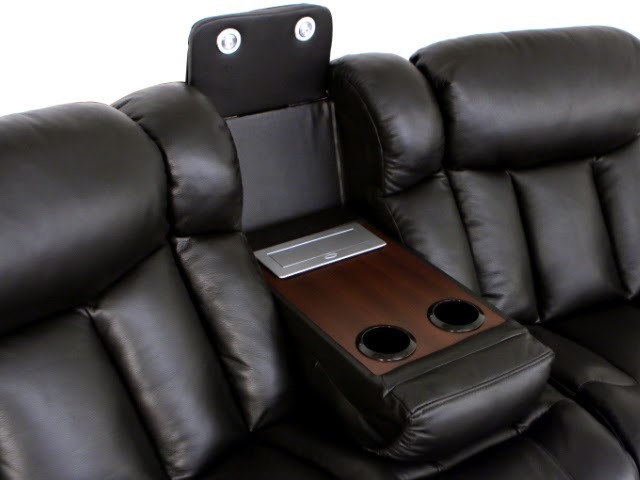 Power recline allows you to adjust to any desired recline position at the press of a button, while USB ports offer a handy means to charge cell phones, tablets, and any other electronic items needed for a full night's entertainment. Each armrest of the Grenada LX also features lighted cup holders, which emit a warm azure glow that keeps your beverages secure and discreetly lit, and are matched by ambient base lighting that provides a sensational marquee accent in a darkened room. Many other sectionals may boast one or two of these features, but all in one place? The Grenada LX has it all! As if that weren't enough, included tray tables offer plenty of space for snacks, remotes, magazines, tablets, and anything else you may need to make your evening complete. When done for the night, simply place any items within the ample storage space located within each armrest. With this many exciting options to choose from, you won't be able to turn this fully-loaded home theater sectional down! !